It was a spectacular event, to be sure, but it was not a gala affair. It was a serious, moving event. It was the commemoration of the 70th anniversary of the liberation of prisoners from the Nazi death camps of Auschwitz-Birkenau. 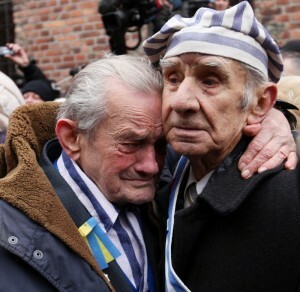 On January 27, 2015, over 300 survivors, along with 3000 guests and dignitaries, gathered in Oświęcim, Poland on the grounds of the Auschwitz-Birkenau Museums for the commemoration. The survivors were – deservedly so — the center of attention. They are some of the toughest people that one will ever meet. They lived through the horrors of the concentration camp. But, the commemoration also honored those who did not live to be liberated from the camp — over 1.1 million Polish citizens, European and Polish Jews, political prisoners, Gypsies and others died there. The event was the initiative of the Auschwitz-Birkenau State Museum and the International Auschwitz Committee. And, it was my distinct honor and privilege to attend the commemoration with Marcin Chumiecki, Director of the Polish Mission at Orchard Lake Schools, Orchard Lake Michigan, as special guests and American representatives. One could see the railroad tracks leading into the camp in the middle of the tent, under see-through Plexiglas. I wondered what thoughts the survivors had as they sat in the tent, facing the entrance to hell. This is where they entered the camp as prisoners over 70 years ago. In addition to the survivors and guests, over 40 different nations sent dignitaries to the event. The President of Poland, Bronisław Komorowski, was there, along with United States Secretary of the Treasury, Jack Lew, President Francois Hollande of France and the Presidents of Austria, Bulgaria, Croatia, France, Germany, Italy, Malta, Slovakia, Slovenia, Switzerland, Ukraine, Prime Ministers of Belgium, Czech Republic, Luxembourg, Netherlands, Norway, the Queen of Sweden and the Crown Prince of Denmark, to name just a few of the dignitaries, who also came to honor the survivors. Other special guests included Steven Spielberg, who has provided support for the event, and created a film, “Voices of Auschwitz,” released on the day of the event. There were several speeches, all with solemn and respectful words. The main message was “remember what happened here, never forget.” President Komorowski of Poland addressed the audience and noted that the world must prevent any replication of Auschwitz-Birkenau or the Nazi regime in the future. Piotr Cywinski, Director of the Auschwitz-Birkenau Museums provided brief, but direct remarks to the audience. He stated that, the museums “take on a form of warning, a horrid warning” for future generations. Three survivors also spoke and, at times, moved the audience to tears. One, Roman Kent completely captivated the audience, and called for world leaders to remember what happened at Auschwitz-Birkenau. “We do not want our past to be our children’s future,” the 85-year-old said to applause, fighting back tears and repeating those words a second time. Marcin and I sat next to Kent’s niece, who had come from Colorado to be with her uncle. She described Roman as “a gentle, normal, next door neighbor type of guy,” but one who had an extraordinary past. That perhaps, is the most extraordinary point to be made about the survivors. Once liberated from horrors we cannot imagine, these people led what we might call “normal” lives, as they worked, raised families, and lived, maybe, as your next-door neighbor. To say the least, this was a once-in-a lifetime occasion. As a historian, I often experience events and people through the pages of a book. On this occasion, however, Marcin and I were on the actual grounds of Auschwitz-Birkenau. We saw the camps, the ovens, and the evil that is left in the buildings that are preserved as museums for the world to consider and remember. We won’t forget.